It isn't at all uncommon for a movie based on a Stephen King book to be released in any given year. 2017 is no different, and there will actually be two very high-profile adaptations from the mind of the legendary author coming soon. There is The Dark Tower, which has been in development for years now, but as excited as people are for that movie, there seems to be even more buzz surrounding the upcoming remake of Stephen King's IT. We should be getting a trailer soon, but today we have our fresh good look at Stranger Things star Finn Wolfhard in the movie. 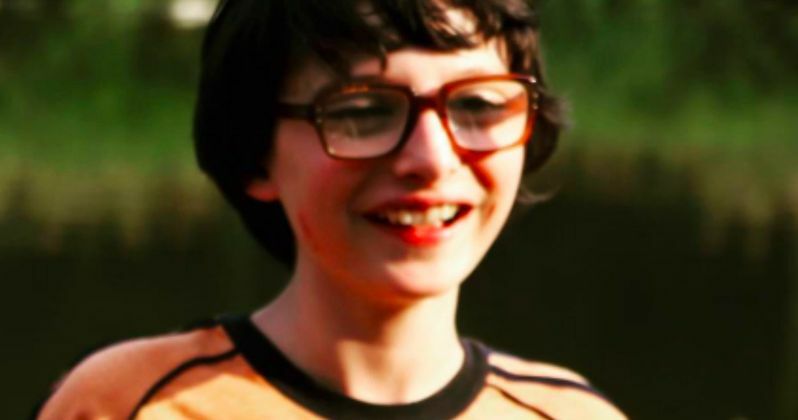 The picture, which shows Finn Wolfhard in character as Richie Tozier, a member of The Losers Club, was shared on Instagram by producer Barbara Muschietti. The only other photo we saw that featured the Stranger Things star was one that director Andres Muschietti shared, which featured Richie on a "Missing" flyer. This new image doesn't give us a whole lot of context, but Finn Wolfhard looks like he'll fit in quite nicely in the cast and he looks very innocent. That should make it all the more awful when Pennywise shows up. IT finished filming several months ago and the studio held a test screening recently in California. Assuming that screening went well, the movie is either done or very close to done. Studios will often make adjustments depending on how test screenings go, so they could be doing some re-editing or possibly even some pickup shots, depending on the feedback they received. Either way, the movie is probably very close to being in the can. That being the case, we could be seeing a teaser trailer for IT any time now. We have seen a good handful of images online, several of which giving us a very good look at the new version of Pennywise the clown. But we still have seen a whole lot that features any of the supporting cast members or anything that gives us a real sense of what to expect. So, hopefully, some footage will arrive soon. Stephen King's novel was previously adapted into a 1990 TV miniseries in which, Tim Curry played Pennywise. So while this new version will not be the first time the material has been adapted for the screen, it is actually the first time it has ever been made into a feature film. This new IT adaptation will reportedly be split into two movies, just as the miniseries was split into two parts, with the first centering on a group of children known as The Losers Club, who must fight off this evil spirit known as IT. The second movie will bring these characters back together as adults, as they must stop IT once and for all. It has been stated that it will be a "fresh" take on the material. Bill Skarsgard leads the cast of Stephen King's IT as Pennywise the clown. The cast also includes Jaden Lieberher, Finn Wolfhard, Jack Dylan Grazer, Wyatt Oleff, Chosen Jacobs, Jeremy Ray Taylor and Owen Teague. IT is being directed by Andres Muschietti and is currently set for release on September 8, 2017. Be sure to check out the new photo of Finn Wolfhard for yourself below.